Healthcare: The Most Challenging Wi-Fi Environment? Is healthcare the most challenging vertical market for Wi-Fi design? Many engineers could make a strong case that it is, and I would probably agree. A few weeks ago, I spent the day with Jon Linton and Doug McDonald (both CWSPs) at Henry Ford Health System (Detroit, MI) for a first-hand tour of their environment, challenges, and deployment strategies. Like most healthcare environments, they have their hands full. Every vertical has its own challenges: K-12 education has paltry budgets, old brick buildings, and potentially high user density; Universities have extremely diverse client populations, broad security requirements, high density, and demanding user expectations; retail and warehouses have difficult building designs and construction materials, as well as highly dynamic RF conditions; hospitality has aesthetic restrictions and access restrictions; everyone is understaffed; and the list could go on.But, healthcare has almost all of these challenges and more, all at the same time. VoWiFi, video over Wi-Fi, teleconferencing, hi-res image transfer, location services, guest access (email, browsing, chat, etc. ), hospital apps on consumer tablets, custom mobile apps, patient records (COWS and tablets), patient monitoring, x-ray, and a long list of other applications are standard fare in hospitals. Mission-critical applications all have their own service requirement from the network, and they’re often demanding. That list above is only the beginning of the applications, but what’s more dramatic is the number and types of client devices that must access the network. For example, any given hospital will likely have a diverse set of laptop computers (with variant OSs, drivers, NICs, etc. ), consumer tablets, business-ready tablets, mobile phones, VoWiFi phones, and guest laptops and mobile devices. On top of that, add at least 10 (or significantly more) different types of purpose-built medical hardware with widely varying capabilities and design. Many of the custom healthcare applications (x-ray machines, infusion pumps, telemetry and other monitoring systems) are deployed on purpose-built medical hardware. This can be a bit of a problem. The medical device manufacturer decides to make a wireless EKG or X-ray machine, and they decide to use Wi-Fi for connectivity (Wi-Fi is easy, right?). Their specialty is EKG or X-ray, not Wi-Fi. So, they build a killer mobile X-ray machine that sells for tens or hundreds of thousands of dollars, and this machine has a $13 802.11b Wi-Fi card with no diversity in it. And when I say “in” it, I mean somewhere deep down in the bowels of the machine, mounted behind lead, RF-blocking panels. However, the high-dollar doctor (whose Wi-Fi experience is based on a MacBook and a home wireless router) chooses the medical devices that will be used and the wireless engineer is stuck untangling the connectivity mess. In most industries, the network guys have a voice in client device selection, but in many healthcare situations, the engineer’s voice has only a whisper of influence. At a minimum, it would be great if we could provide decision makers with a list of recommended medical device options meeting a minimum set of network criteria (possibly Wi-Fi Alliance certification). Legacy devices (how often do you want to replace a two-hundred thousand dollar machine?) that don’t support modern WLAN features. Buggy devices with unfortunate dependencies, such as 1 Mbps data rates or long preambles. While at HFHS, Doug often referred to the old hospital in downtown Detroit as a “bunker.” It really is. It’s a certified bomb shelter, which makes the RF challenges…challenging. While walking through the polished two-year old facility where I visited, at one point I felt like we were walking in circles. We turned a corner and Doug and Jon both sort of looked at each other quizzically: “There was a wall there before, right?” “Yep!” Hospitals (even new ones) are undergoing constant construction, reminding us that the RF domain is in a continual state of flux. Intuitively, we’d think this tees us up for automated channel and power features, and in some instance that may work well. However, many hospitals also have significant access restrictions, forcing engineers to mount APs mostly in the hallways, which can have an unsavory affect on radio resource management features because power levels are tuned down too low. 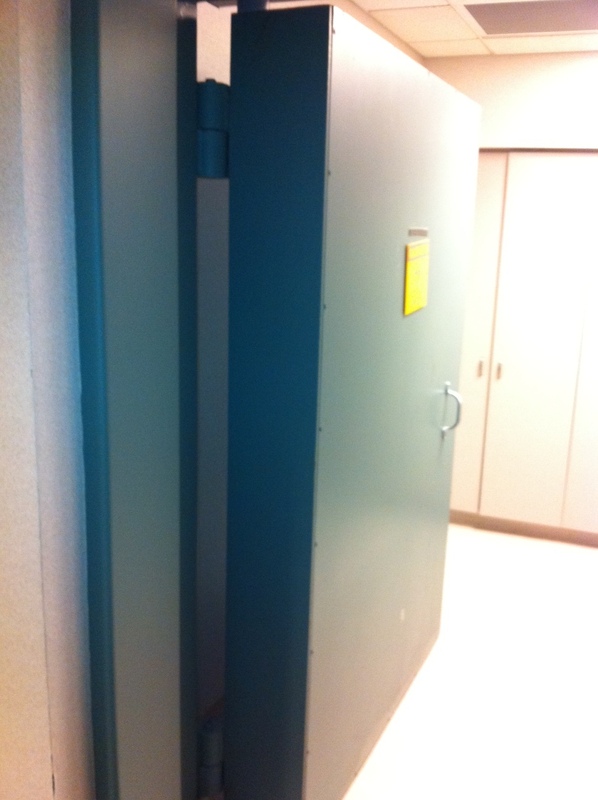 That’s the 80 dB (give or take) entrance to the cancer treatment room. They use a focused beam of radiation to destroy cancer cells. Yikes. The business of hospitals naturally requires cleanliness and aesthetic appeal. These requirements limit the locations and methods for AP mounting. Patient comfort and medical procedures also require privacy, further restricting AP mounting locations and access. Other competing priorities in healthcare environments naturally take precedence, which funnel us network folks down into a claustrophobic box of deployment options; but, contrary to the often ego-centric whims of doctors, the laws of physics refuse to change to accommodate our needs. Darn you, inflexible physics. For fun, let’s add some regulatory requirements, like HIPAA and PCI, to the monitoring and security mix as well. Why not? Then we’ll add some more challenges with OSHA and other oversight groups that require us to get approval before we can mount an antenna anywhere at all. We might get off on some egoistic self-importance by making our jobs seem uber-important, but it’s undeniable that hospital network systems present some additional urgency and stress when it comes to mission-criticalness. Most businesses have high demands for network uptime, but the pressure for absolute up time in a hospital is pretty high. Maintenance windows are practically non-existent. First, I want to thank Doug and Jon again for showing me the ropes. These guys have their hands full, but the HFHS wireless networks are in very capable hands. Second, I want to qualify that this article is not based solely on my experiences at HFHS. I’m drawing upon other experiences and conversations about the healthcare field. HFHS is a characteristic, challenging healthcare environment, but they’re also addressing some of these issues head on. Finally, I’ll just reiterate that healthcare wireless is a bugger. The business requirements of a hospital are a bit like a perfect storm for wireless networks. The applications are demanding; the client devices are diverse; the buildings are dynamic, with RF obstacles around every corner (or not); regulatory compliance, access restrictions, and aesthetic priorities create significant limitations; engineers have restricted influence in decision making; then there’s plenty of stress from uptime requirements, urgency, and office politics. Mix all of these ingredients together and the result is like a Ford Focus trying to fit through the eye of a needle. Good luck with that. 0 Responses to Healthcare: The Most Challenging Wi-Fi Environment?